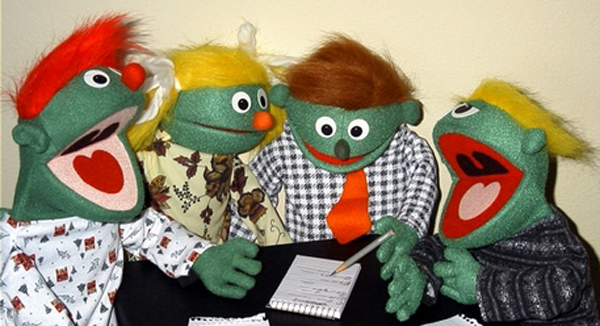 In the fall of 2001, Diane and Lynn formed the basis of a group intending to use mainly puppetry to provide the "medicine" of laughter to those who needed "the cure." Feverishly, we began putting together what was needed to perform local shows for those in need of a dose of laughter. We fashioned a stage, acquired a handful (pun intended) of puppets, a small sound system, and a dozen or so songs that emphasized positive living and self-esteem. We strung them together with some light hearted dialog and began to practice. We always intended to do more than puppetry and expand the music selection in time--but it was a start. See a news clip about our puppet supplier. For our cast and basic stage we use puppetry products from Puppets Inc. exclusively, because they are simply the best (for kids of all ages)! Everything else is designed and developed in house. You would be hard put to find another organization that is as much fun. We are amazed that the laughter ever stops long enough to practice anything, let alone make it to a show on time! 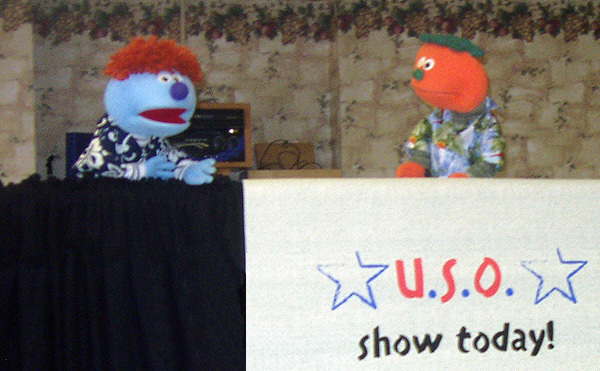 Patch Works performed its inaugural show in May 2002. It quickly became obvious we were onto something, so we registered as a 501(c)3 non-profit organization shortly there after. Patch Works in Guatemala, 2004. We continued to grow and go through growing pains, but have become a self-sustaining organization, capable of reaching out across the globe if necessary to bring laughter where it is needed. We have performed as close as 1 mile away from our home office, and as far away as Guatemala (shown above from left to right: Swee'Pea, Diane, Lynn and Punkin, surrounded by the children of Pocohil School). We have two different sized stages, two different sized sound systems and nearly 60 characters to laugh with. The most laughter we shared in a single day was for over 900 people, not all at the same time. The most shows we have done in a single day is 3 (many times), and the busiest time of year is the holidays when we average around 15 shows in a 2- week period. We have written and performed 8 different standard shows and 6 different holiday shows since our first show in 2002. Our first fifteen years flew by. Here's to the next fifteen!